The acidophilic, Fe(III)-reducing bacteria Acidocella aromatica PFBC and Acidiphilium cryptum SJH were tested for their ability to produce palladium (Pd) bionanoparticles. The XANES analysis was employed to clarify the involvement of chemical and biological reactions in the mechanism of Pd bionanoparticles crystallization. Normalized Pd L3-edge XANES spectra (Fig. 1) indicated that enzymatically formed Pd(0) nuclei correspond more closely to that of Pd(0)/C than Pd(0) metal, confirming the close association of the enzymatically produced fine Pd(0) nuclei with the cell biomass. Pd(0) nucleation resulted from enzymatic Pd(II) reduction using intracellular electron carriers (such as NADH) (Fig. 2). Formic acid-dependent reactions proceeded via this first slow Pd(0) nucleation phase (biological) and the following autocatalytic Pd(II) reduction phase (chemical). 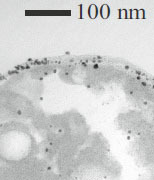 Use of active cells (with full enzymatic and membrane protein activities) at low formic acid concentration was critical to allow sufficient time for Pd(II) biosorption and the following enzymatic Pd(0) nucleation, which consequently enabled production of fine, dense and well-dispersed Pd(0) bionanoparticles (Okibe et al., 2017). Fig. 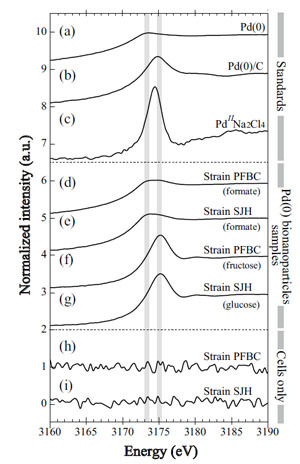 1 Normalized Pd L3-edge XANES spectra for Pd standards (a–c), Pd(0) bionanoparticle samples produced by Ac. aromatica (d, f) or A. cryptum (e, g), and bacterial cells only as controls (h, i). e-donors used are indicated in brackets (Okibe et al., 2017). Fig. 2 TEM images of Pd(0) bionanoparticles produced by Ac. 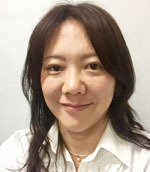 aromatica (Okibe et al., 2017). "Palladium bionanoparticles production from acidic Pd(II) solutions and spent catalyst leachate using acidophilic Fe(III)‑reducing bacteria". "Investigating factors affecting the size and distribution of Bio-Pd(0) nanoparticles"
"Formation of Bio-Pd(0) nanoparticles using Fe(III)-reducing, extremely acidophilic bacteria".